When you live in the upper Midwest, where it’s cold 6+ months of the year, a fireplace feels less like an extravagance and more like a necessity. When we bought our house we weren’t sure whether the fireplace was operational. The house inspector was able to tell us that the chimney didn’t seem to be blocked off at the top but that was about it. 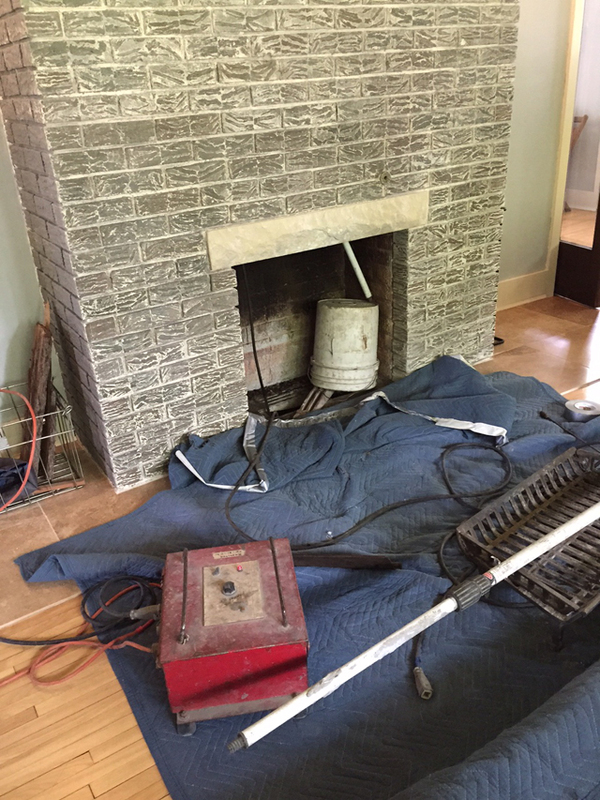 (He made sure to tell us repeatedly that he was not a licensed chimney inspector and that we should have the fireplace fully checked out before using it). Since we closed on the house in late November, we weren’t able to have the chimney inspected that first winter. We spent those first freezing months in the house wishing we could use the fireplace and counting down the days until spring so we could have it serviced. We tried to content ourselves with the wood burning stove in the basement but, honestly, it just wasn’t the same. You can’t see the fire in a stove and you can’t fully appreciate the crackles and pops that it produces. And then, one cold, cold winter day, I removed the metal sheet and piece of insulation that had been stuffed inside the chimney just above the firebox and shined a flashlight up into the darkness. “I can see light!” I called out to The Mister. And if I could see light at the top of the chimney, that confirmed that the fireplace had not been capped off. As far as I was concerned, that was clearance to start a fire in the fireplace. I started with a tiny little fire that first time. First, I wanted to make sure that the smoke was going to get drawn up into the fireplace and out of the house. When that seemed to be happening I was confident that we could infrequently build small fires while we waited for the weather to warm and the chimney sweep to make it out to the house. When spring did roll around, we made an appointment to have the chimney swept and inspected. Our hope was that we’d be able to have the chimney swept and then we’d be good to go. As these things tend to go in old houses, our hopes were not met with reality. It turns out that the pipe for the basement stove was running up the middle of the chimney, making it impossible to get a brush around it to sweep the chimney. Plus, the chimney sweep informed us, an inspection of the chimney showed that the liner was crumbling. The danger in that is that if the wood lathe is exposed and enough heat is created inside the chimney … well, we definitely wouldn’t have any trouble staying warm! We could just roast marshmallows outside the house as it slowly burns to the ground. The chimney sweep gave us two options. We could keep the stove in the basement and have a fireplace insert installed upstairs. Or we could remove the basement stove entirely and have the chimney relined. Both options would cost roughly the same. The chimney sweep pushed us toward the insert. It would be more efficient, he said, and would allow us to keep that stove in the basement. He could have saved his breath. We had pretty much made up our minds before he finished his sentence. Fireplaces were an integral part of Frank Lloyd Wright’s designs. In his own homes there were often multiple fireplaces throughout the house. And in Wright’s designs for others, the fireplace was almost always the center of the home. Even in these American System Built Homes, the fireplace was central to the design of the house. 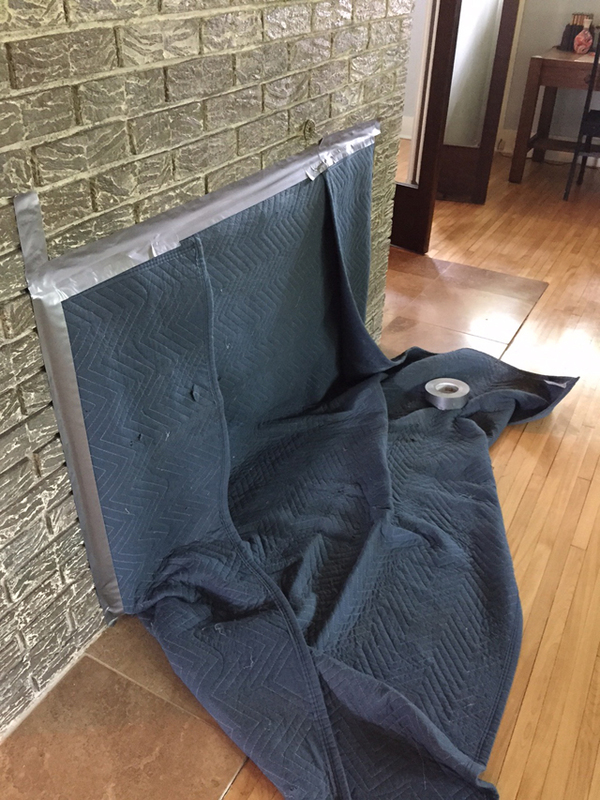 As we’re trying to restore as many of the original features to the house as we can, and with the fireplace being one of the few originals left, we knew right away that we didn’t want to install an insert. What we would have gained in efficiency we would have lost in charm. So we made the choice to sacrifice the stove and have the chimney relined. 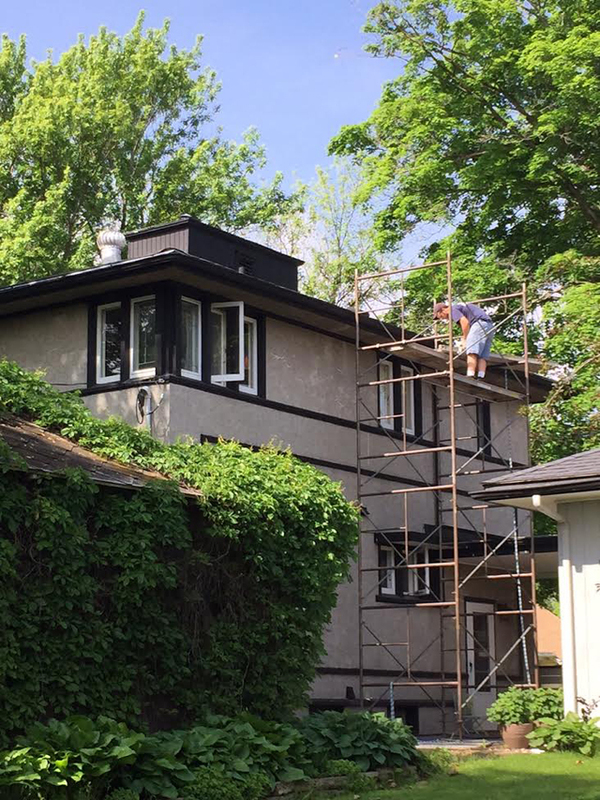 That was last summer when we decided to move forward with having the chimney repaired. We wrote out a check for a deposit and then waited for the chimney folks to come back out and do the work. And we waited. And waited. Some time around October I called to see if we could expect the relining to happen before snowfall. “You’re next on the list,” they told me, “but we probably won’t get out to you until spring.” That was not what I wanted to hear. But of course our hands were tied. We had already written out a sizable check to cover the deposit so we’d just have to wait. And in the meantime, we might have enjoyed a fire or two in the fireplace. Ssh … don’t tell the fire inspector. 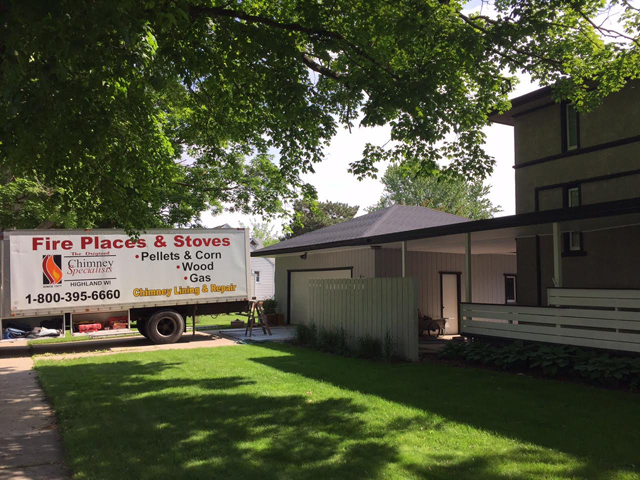 Now that it’s summer, the chimney folks finally came back and poured a new chimney lining. 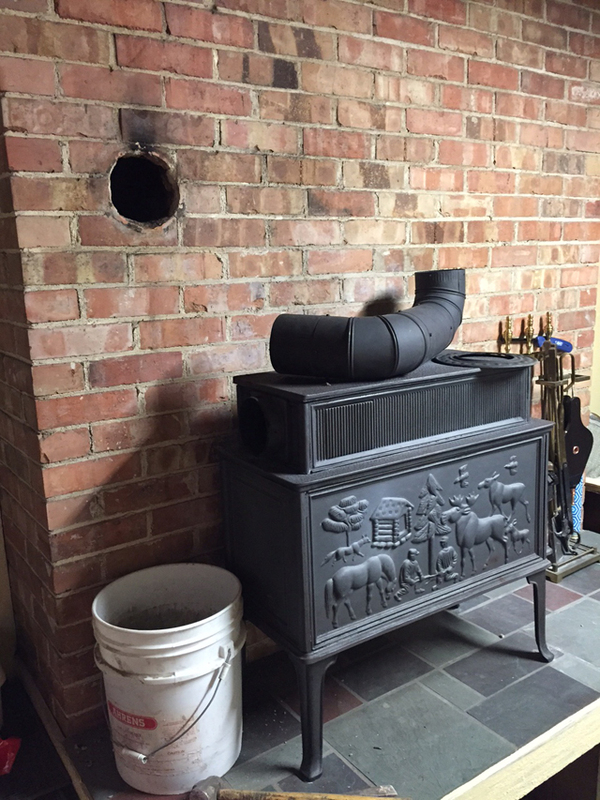 First, they removed the pipe for the basement stove from the chimney and then sealed it off in the basement. Now that the stove has been rendered useless, I can say that I will in fact miss it. I mean, I’m happy that we’ll have a working fireplace in the living room. But it was nice building fires in the basement when we were down there working on projects. We do plan on having a gas fireplace installed in the basement at some point. For now, we’ll rely on space heaters to warm the basement over the winter. Once the pipe was removed and the hole for it had been sealed off, the chimney guys poured the lining in the chimney. I wasn’t home that day but The Mister reported that it was a very noisy operation that got the attention of half of our small town. According to The Mister, neighbors pulled out lawn chairs to watch the operation in progress. And more than one car made several passes in front of our house that afternoon. You gotta love small town life. Meanwhile, I was in awe of the scaffolding and the way the guys stood on top of the roof as if it’s nothing. All in a day’s work for a chimney sweep, I suppose. The job took the entire day – from removing the stove pipe and sealing it up to pouring the new lining and installing a new trap door in the basement. As it turns out, the company we used – Chimney Specialists out of Madison, Wisconsin – used to be on contract for the chimneys at Taliesin. 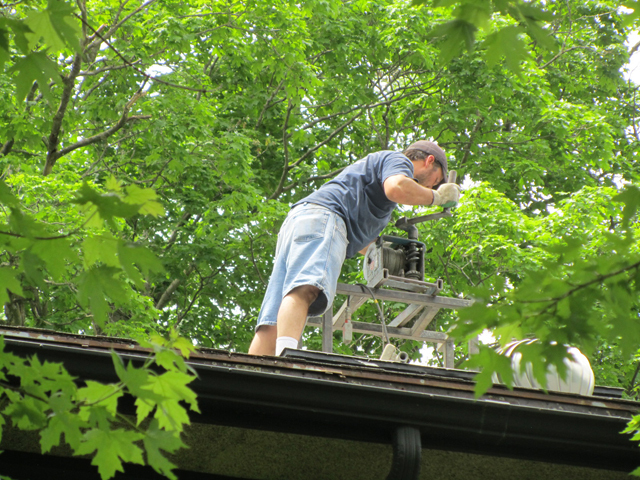 And, of course, it wasn’t until after we had the work done that we learned there was someone local who could have relined the chimney. We’ll be back to use you as a chimney sweep next time, Kurt. We’re looking forward to a winter full of crackling fires in the living room. Now, know anyone who wants to buy a used wood burning stove? 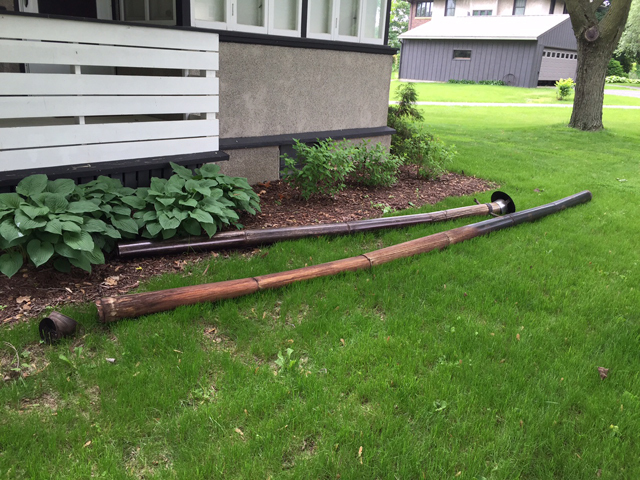 This entry was posted in American System-Built Home, Maintenance, renovation on 06/08/2015 by Jason. I love the history of this home. Frank Lloyd Wright was an architectural genius! Have fun sitting around a warm (now safe) fire when the weather cools!